Irish champion Rory McIlroy stated what most professionals on the US Tour probably already suspected. Without the late, great Arnold Palmer, there was no way there would be as much money on the Tour in the week-to-week events that the world’s best players get to chase every week. It was a special tribute from the FedExCup champion, who recently banked more than $10m for his end-of-season success. Indeed it was also revealed that news of Palmer’s passing had purposely been kept quiet until the FedEx and Tour Championship winner had been decided. 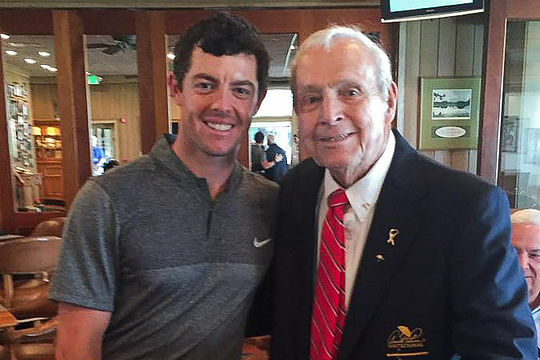 Several years ago Palmer joked that he might break McIlroy’s arm if he didn’t tee-up in ‘his’ Arnold Palmer Invitational at Bay Hill in Orlando. It took a few years but McIlroy did make it to Bay Hill last year and finished 11th.